It’s been around for a while and I have been following Paper.li sporadically – if content was created by one of my Twitter followers/authors. If you haven’t paid attention to these Paper.li articles yet: Creating your own Paper.li means, you can add your own Twitter / Google+ / Pinterest / FB content to it – not only that of your followers. One tool more for authors, to attract attention to their tweets and certainly to their writing! “Paper.li is content curation service that enables you to become Editor-in-Chief of your own news site and publish a topic based newspaper from content you find anywhere on the web, such as Twitter, Google+, Pinterest, YouTube or Facebook. What is online content curation? Simply put, online content curation is the organizing, filtering, presenting and sharing of the most relevant digital content for a specific audience. People (and not machines) are the ones, qualified to make that final selection of content needed in order to identify the content that matters most to them, and for their audiences. We also think that these same people can greatly help their own communities to find their way through this “massive content world” we live in. Why should I make a Paper.li? The act of content curation and the filtering of content for specific audiences is strongly tied to the future of content. Millions of people are sharing content daily through social media channels and the numbers are growing, making it increasingly difficult to find, organize, share, discover and enjoy. What’s the Secret of a fabulous Paper.li site? “When it comes to news, many Twitter users say they rely on the social network and the community of people they follow— rather than a big news organization—for links to important or interesting news stories. A Swiss start-up called Small Rivers has taken that idea and turned it into a service called Paper.li, which gathers links that your network has shared and turns them into a kind of social newspaper, complete with different sections for different topics. Is Paper.li now the future of news? Perhaps not, but it fills a niche in the social ecosystem of news. Go to Paper.li on Twitter. Click the “Sign In” button on the top right. As you are logged into your Twitter account, Paper.li will recognize your Twitter handle and ask you to confirm. Click on “Create a Newspaper” and fill in your Twitter handle in the first box. Click on “create” and wait for your paper to be published. You can change the title of your paper in “settings”, set the time for which it will generate the daily updates and choose whether you want Twitter to automatically tweet your paper when it’s updated. It’s been around for a while and I have been following Paper.li sporadically – if content was created by one of my Twitter followers/authors. If you haven’t paid attention to these Paper.li articles yet: Creating your own Paper.li means, you can add your own Twitter/Google+/Pinterest/FB content to it – not only that of your followers. One tool more for authors, to attract attention to their tweets and certainly to their writing. “Paper.li is content curation service that enables you to become Editor-in-Chief of your own news site and publish topic based newspapers from content you find anywhere on the web, such as Twitter, Google+, Pinterest, YouTube or FB. “When it comes to news, many Twitter users say they rely on the social network and the community of people they follow— rather than a big news organization—for links to important or interesting news stories. A Swiss start-up called Small Rivers has taken that idea and turned it into a service called Paper.li, which gathers links that your network has shared and turns them into a kind of social newspaper, complete with different sections for different topics. 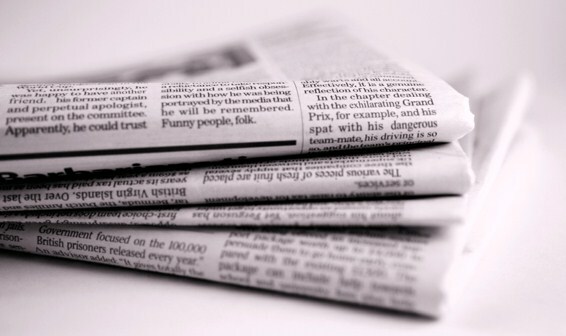 Is Paper.li the future of news? Perhaps not, but it fills a niche in the social ecosystem of news. If you enjoyed this blog post, please feel free to check out all previous posts (there are almost 500 of them : ) if you haven’t already. Why not sign up to receive them regularly by email? Just click on “Follow” in the upper line on each page – and then on “Like” next to it. And don’t forget to spread the word on Twitter, Facebook, Google+, Tumblr or StumbleUpon – or other social networking sites of your choice) – other writers might also enjoy this blog and find it useful.